You don't have to be a vegetarian to love vegetarian food. 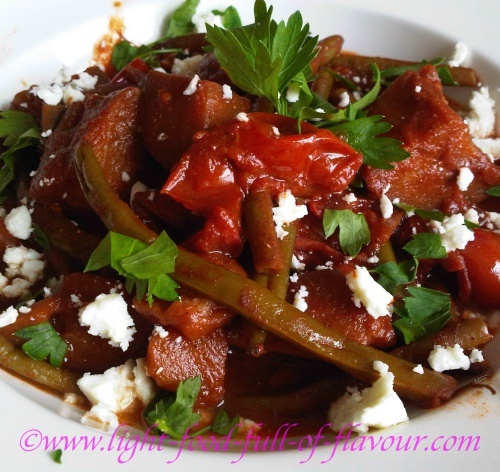 This is a gorgeous full-flavoured vegetarian dish - an aubergine green bean tagine. I got the inspiration for this dish from a friend who lived in Lebanon for quite a few years. She made something similar for me one time, but she only used green beans. I thought this would go ever so well with added aubergine (eggplant). For a really tasty and nutritious vegetarian feast, you could serve the tagine with oven-roasted carrots and/or butternut squash and sweet potatoes, tzatziki and a side salad – to which I would add spinach, dark leafed lettuce and red and yellow peppers (bell peppers). I make tzatziki with 250ml (a little bit more than a cup) Greek yogurt, 1 tablespoon olive oil, 2 crushed garlic cloves, 1/3 of a cucumber – peeled, halved, deseeded and cut into thin half-moons - salt and pepper and some shredded fresh mint. You could also fry or grill slices of halloumi cheese to go with the aubergine green bean tagine. 1. Heat the oil in a large pot or casserole dish over a medium high heat. Place the chopped onion in the pot and fry gently for 5 minutes, without browning the onion. Add the chopped garlic and ground spices and continue to fry – continuously stirring – for another minute. 2. Add the diced aubergine (eggplant) and quickly mix it together with the other ingredients in the pot. Add the chopped tomatoes, tomato puree, water and green beans to the pot. Season with salt and pepper, stir and mix everything together. 3. Bring to a simmer, cover the pot or casserole dish with a tight fitting lid and simmer gently for around 35 minutes – lift the lid and give the tagine a stir mid-way through. Remove the lid and continue to simmer for 3-5 minutes – until the sauce has thickened a little and the aubergine (eggplant) is soft. Check the seasoning to see if you need any more salt and/or pepper. Serve with chopped parsley and crumbled feta cheese on top.